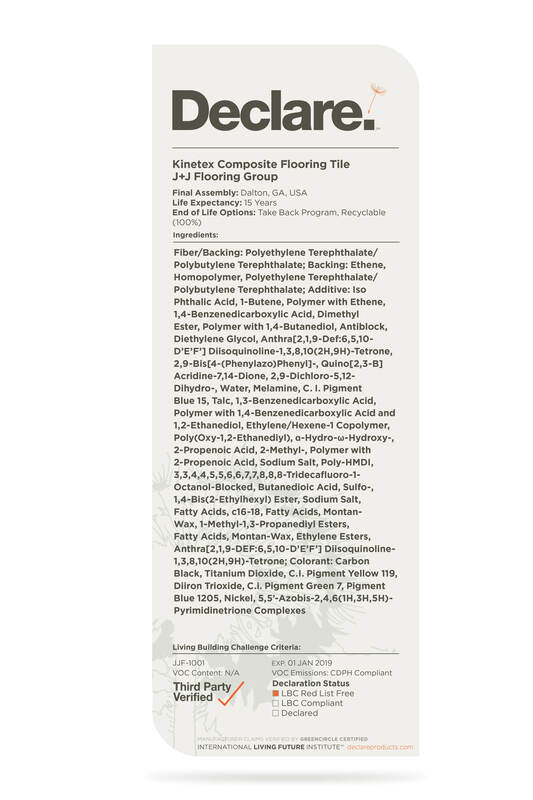 J+J Flooring Group is pleased to offer an EPD (Environmental Product Declaration) for our Kinetex Textile Composite Flooring, all of our standard broadloom and modular carpet products, as well as those broadloom products using our moisture barrier backing, TitanBac® Plus. An EPD includes data on every environmental touch point of a product. In addition to examining raw materials and manufacturing processes, the EPD also takes into account packaging, shipping, installation, cleaning and maintenance during product use, and the end-of-life impact of the product. The declaration is based on verified, objective criteria according to ISO standards and the Product Category Rules for flooring products. J+J Flooring Group is pleased to offer a HPD (Health Product Declaration) for our Kinetex Textile Composite Flooring. To provide GREATER TRANSPARENCY and easier accessibility to product information, J+J Flooring Group offers its customers the following independent verifications of our products’ environmental attributes. Health Product Declarations are a standardized format for disclosure of product contents, emissions and health information to increase transparency and reduce redundant disclosure demands by referencing existing hazard lists and providing a human health context for information disclosed in an Environmental Product Declaration (EPD) and other documents. It is included as a compliance option for the Building Product Disclosure and Optimization: Material Ingredients credit in the current public comment draft of the forthcoming LEED v4 rating system. Where does a product come from? What is it made of? Where does it go at the end of its life? Declare is a transparency platform and product database that answers these questions. At J+J, we’re proud to announce that all Kinetex products carry a Third Party Verified Declare label affirming Kinetex as both a simple and sustainable flooring solution, guaranteed.